0300 hours Saturday 12 December: Hoppo Bumpo secretly tries on the period costume - a Regency-era empire gown - in the dead of night. Completed only moments earlier, its to be delivered to its new owner in just 4½ hours. She puts the memory of sewing the dress three times (two toiles and a final garment); a complicated bodice alteration to increase the bust by 4 cup sizes; slippery satin fabric; the hand-dyed lace incident and other craftsasters behind her .... and smiles. Its the first dress she has made. And it has been, she thinks, just like hitting her head against a wall: fabulous when it stopped. Glad to know you like those patterns. I ponder buying one, but am a novice and hesitate to spend so much money on a pattern, plus materials, in case the pattern overwhelms when I take it out of the envelope and I end up shoving everything in a drawer and trying to forget about it. Having read your review, I will now revisit the pattern website...thanks! Hurray for finishing it it!! But I want to see all of it! The little bit looks amazing. Congratulations! What a fantastic achievement!! The small peek you've given us looks lovely. Thanks for taking us on the Empire Dress Journey - for those of us who are notorious for starting things and giving up when it all gets too hard: this is motivation to keep on keeping on, even if a project is put into solitary confinement for a little while to maintain a semblance of sanity! Fabulous! 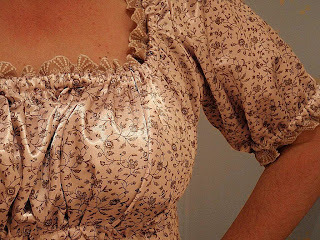 I'm going to try this - I'm re-reading P&P at present and want a Regency dress! I sooooo would have given up by now. You're a champ! OMG, that is great, seriously gorgeous, I need one. Thanks Liesl, you are on fire!! P.S. assembly line of shower caps going on at my place...I have been dreaming of them...sad really. But seriously thanks again for your tute!! Thank you for your lovely comments. It was a great relief to finish it! Unfortunately, at the the moment I don't have a full length photo, but I will try and get one. Oh, congrats on finishing it! I know the sweat and tears that went into it and I daresay there is even some blood there...but I am sure that they will all come out in the wash- it looks fabulous!